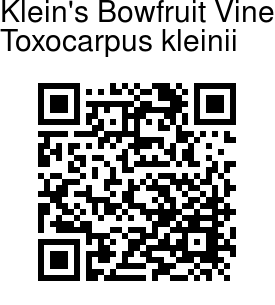 Klein's Bowfruit Vine is a twiner with branchlets velvet-hairy. Leaves narrow into the stalks. They are elliptic to obovate, up to 8 x 4 cm, somewhat leathery, base obtuse, tip shortly tapering. Leaf-stalks are up to 1.5 cm. Flowers are borne in lax cymes, on stalks up to 3 cm. Bracts are lanceolate, 3 mm. Flower-stalks are 0.5 cm. Sepals are 5, ovate, 4 mm, rusty hairy without. 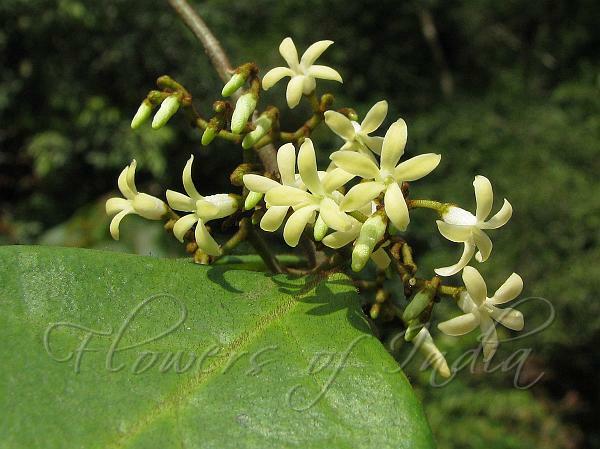 Flowers are broad-bell-shaped, cream, 1 cm wide. Petals are 5, oblong, 1 cm, recurved, overlapping to left in bud. Corona is 1, of 5 erect, dorsally flattened segments attached to staminal column. Stamens are 5; connective produced above; pollen masses 2 per cell, ascending. Style apex elongate, longer than staminal column. Seed-pods are paired, elongate, fusiform, 15 x 1 cm; seeds are oblong, 1.5 x 0.6 cm; coma silky. Klein's Bowfruit Vine is found in Peninsular India and Sri Lanka. Flowering: July. Photographed at Anshi WLS, Karnataka.